Last season’s “Brown Betty” was about experimenting with form to achieve maximum emotional wallop. I adored that episode, both because I love all things noir and because Walter’s emotional situation was so complex and weighty that the unusual presentation seemed both necessary and inevitable—not a writerly choice so much as a real expression of Walter’s innermost emotional narrative. Like “Brown Betty,” “LSD” plays with presentation to explain an arc more affective than active. How much you enjoyed this episode probably depends on how much you enjoyed the presentation. While the Inception-influenced early portion of Walter and Peter’s dream-walk through Olivia’s brain didn’t do much for me (beyond reminding me of Inception), the second part was delightful. Not because it was the most beautiful animation ever, but because the cartoon image seemed to influence the story: Peter’s leap off the building to the zeppelin’s rope ladder, for instance, makes sense according to cartoon physics. The drive through the Jacksonville military base was like an old Flinstones in which the same background was used to save money. And Bell got over an implicit fear of motorcycles in the safest way possible: a cartoony trip in someone else’s consciousness. They didn’t overdo the hallucinogenic humor, though. Peter’s in-lab fixation on Broyles’s bald pate was punchy, and Broyles’s own morbid bubble-blowing was a great character moment. But within the dream-world, the only LSD influence I could detect was the emphasis on grids in the layout of both the city and the base. The content of the dream-world does raise some questions, though. Why did it take place Over There, if that’s a correct surmise from the presence of the Twin Towers? Why was Nina Sharp working against Peter, Bell, and Walter? Was she evil, or was she a guardian created by Olivia’s subconscious to protect Olivia from harm? If she’s evil, that raises a slew of questions that are either incredibly important or utterly irrelevant. (“I wear the cheese. It does not wear me.”) Ditto, if she’s a guardian. And the most important one: how can Olivia’s consciousness know the man who will kill her, if she doesn’t know who he is? We won’t know if those questions matter, or if they are even the right ones, until next week or beyond. But we do now know that Olivia has moved past her childhood trauma and is no longer afraid of her stepfather, Brandon-zombies, or anything else. As the chewy emotional center of this digressive episode, the revelation and resolution of Olivia’s Massive Singular Issue wasn’t up to the level of Walter’s complicated emotional maelstrom in “Brown Betty.” Is Olivia really a scared little girl inside? Think about all she has done, all she has accomplished, and all she has fought for, both personally and professionally. Perhaps the recent re-membering of the Cortexiphan trials consolidated her fears into one six-year-old bundle…but really? The emotional resolution felt too easy, in other words. Although that little girl was insanely adorable. Walter’s short step towards okayness was important, though. At episode’s end, he was stuck in a grief-fueled depression over the loss of his friend. But I suspect he will come to realize that Bell was right: Walter has changed since his misspent youth. He is capable of making the just choice. Bell did not claim the same capability for himself, although he did the right thing by choosing to disappear. Peter, too, got some resolution. He’d been keeping his anger and sadness over Olivia’s (most recent) disappearance under wraps, but his intense hug with Walter in the lab, and his happy-puppy look when Olivia returned to his body spoke volumes about the weight of his tension and the relief he felt. I stopped worrying too much about what’s coming next on Fringe. Inevitably, I’m wrong and happy that I’m wrong. But I do hope that Olivia gets to do something awesome, soon. Recently, she’s been strapped down (okay, that was Fauxlivia), moved around, mentally raped, and portrayed as an emotionally unstable child. I’m ready for her to be powerful, forceful, and awesome again. It has been too long. • Walter: “Astro, are we ready? • Did anyone else get a thrill out of Bell bothering to pour himself—and drink—a scotch when he’s nothing but a consciousness inhabiting another person’s body undergoing and LSD-induced group hallucination in cartoon form? • The Brandon-zombies were very Walking Dead. • That was a lot of Walter/Peter hugging, back in the lab. • When our heroes were on the roof, looking out over toonland, were those ambered buildings on the right, in the distance, or green rolling hills? Three out of four red doors. Loved Walter on the bus and when he yelled ASTRID! and she's right next to him. Did Astrid say Wally on purpose to get back at Walter for getting her name wrong yet again? Also Peter and Bell found the red door in the recurring fringe sequence "green-green-green-red"
As for the cell-shaded animations, I didn't like them all that much. Maybe they didn't want to pay Nemoy for his image in a whole episode? I liked the themes and plot, but could do without the clunky animation. the rotoscope animation detracted from the emotional impact and the nuance of acting. it also seemed like an intentional foil to cover up the fact that Nimoy wasn't going to act in the episode, only speak. I liked the allusions to Inception, but found the animated avatars to be like wooden puppets. compared to the live-action intro, the animated resolution was too easy and Olivia looked like a Barbie doll. I found Broyles' lines to be the most intriguing, and we may well see that death has followed him over to this side. Very perceptive regarding Broyles, and what his fate may, in terms of "death following" him over to this side -- I wonder if it could have anything to do with the ominous warning from Pinkner & Co. About a character we love dying in the finale...but we do know that foreshadowing as a plot-forwarding technique is well used by the producers. I actually wasn't too bothered by the use of animation; many of the actions that occurred would've been impossible or extremely difficult - not to mention expensive and time-consuming - to do in live action (everything to do with the zeppelin, the zombies, the army trucks chasing them, etc.). There's a certain freedom that animation allows the plot. It never occurred to me while I was watching the episode that they were using animation because of Nimoy wasn't going to act. That being said, I do agree that in using animation, they sacrificed heavy emotional moments. 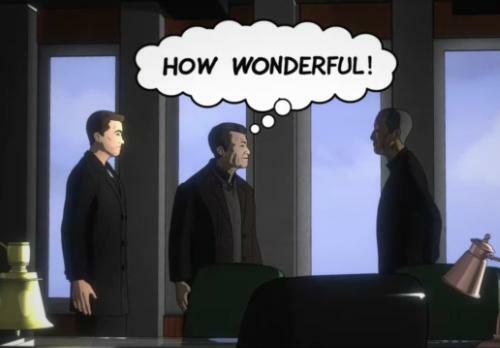 But then I remember Walter's thought bubble and William Bell drinking scotch, and the animators are forgiven. Did anyone notice before Bell disappears there's a blond man behing him (instead of Olivia's stepfather), when he is talking to her at the end of the animation... Did anybody recognize him? He must mean something. I know continuity mistakes are expected to happen on movie scenes, but I doubt they would have spent so much time and energy making an animation to come out wrong, right? Also on the animation of Leonard Nemoy had nothing to do with money it was because he has retired from acting and they found a compromise with him where he can refrain from acting yet still be a part of the episode. I thought the animation was a great way to branch out and bring back Belly for a time. The only thing is that is was harder for emotions on the younger actors and hard to tell who people are like this blond mystery man and the man in the blimp. I will probably not recognize the man in the blimp when he is not in animation. WORST. EPISODE. EVER. truly a low point for FRINGE, even by Season One standards. The dream world was derivative (INCEPTION SCANNER DARKLY, et alia) and non-sensical (it felt like it had no relation to the narrative we've been following) and non-engaging (was it the lame story? or just the 2d acting?). this was the first episode of FRINGE since season one where i found myself checking my watch every five minutes, hoping we were near the end. i hope this is not a harbinger for the rest of an otherwise excellent season. I agree that guessing what comes next is fruitless at this point. I just don't feel things will be the same ever again. This I hope has redefined Olivia for the better. A couple of things I liked in this episode. Clever introduction of the mystery man in Olivia subconscious. Broyles' induced-rantings seemed a bit like what the foreshadowing in "Brown Betty". Why did everyone has that animated Spiderman look except Olivia. Bell having never died an ordinary death still gives me hope, his body like his mind is somewhere out there in existence. Can there ever be a review without movie references? I am about a decade behind on anything that is not Star Trek or animation. I am forced to draw my own comparisons from ST:TNG's The Schizoid Man and Dark Page. No, not so much. Not nearly the best but had some good points. I'll have to watch a couple more times to make a final decision. I am not big on animation, haven't been since I was a kid. Once in a great while something comes along to stir my interest - unfortunately, this is not one of those time. I didn't realize the zombies were supposed to be 'Brandon', too weird. I hope it did resolve Olivia's fear issues and other things and we see her more pro-active like her OT counterpart. Now to find out who that man with the red X is and why he wants to kill Olivia. Odd, she seemed down with the idea he was going to kill her. A little too mellow perhaps? I am sure more major twists ahead! I loved this episode. Unexpected yet interesting approach. Go Fringe! Personally, I loved this episode because of how it set us up for the finale. Even if you didn't like how 3.19 turned out, I think you have to hand it to the writers for trying something out of the box. They aren't going to bat a thousand but the experimenting has made Fringe what it is today. The writers and producers haven't been afraid to stretch the limitations and us fans should support them in that if we love what they have created overall. You'd move to if you had ice on your privates! I just loved how effectively he jiggled! It was like an ocean of stomach! I think it was the most talented corpse Fringe has ever seen!!! IMO, like Brown betty, I'm sure there will be "easter eggs" that will show up later this season and next year. So i'm not writing this episode off so much. The "X" on "Mr.X"'s t-shirt looks like an aerial view of two sets of the Twin Towers. Hmmm. Re: Olivia knowing the man who will kill her. I'm getting a real "Slaughterhouse-Five" vibe off of this (back to war and soldiers again) and other recent developments. Is someone now or on their way to becoming unstuck in time? It occurred to me that "The Last Sam Weiss" is partly intended as a pun. Read up on the plot of "The Last Samurai" (back to war and soldiers again) and see what you think. And Peter unlocked some chains with a key (Houdini again). I liked this episode, but I won't say it was the best or the worst or anything. I think the best part of this episode was that it managed to move the plot along while taking care to reveal some hidden information about Olivia's mind. Questions like: "Why is this set Over There?" and "When is that guy going to kill Olivia and how the hell does Olivia know about it?" Those are important and I think we'll see those touched on later.